Capsule Summary: Hawkeye and B.J. are made morale officers; Charles saves a soldier’s leg at the cost of limited mobility in one arm, then learns the soldier is a concert pianist. Half of this episode is forgettable at best, painful to watch at worst. Hawkeye and B.J. are too childish, Colonel Potter is too angry, Klinger is too eager, and the entire camp is too demanding. The idea of Hawkeye and B.J. being forced to serve as morale officers isn’t a bad one. The way it plays out, however, is too exaggerated, too absurd, too silly. Everyone chanting “Kill the cook!” in the Mess Tent? Really? That’s not funny, that’s stupid. I do enjoy Igor’s rant about not being responsible for the food. I’m guessing Jeff Maxwell was really excited when he got the script for this episode and learned he had a long speech. If only Hawkeye had remembered the amazing ribs he had shipped from Chicago in “Adam’s Ribs” during Season 3. Bring in boxes of ribs and tubs of sauce and have a barbecue–much easier than trying to put together a beach party. It’s too bad the party scene had to be shot on the Stage 9 sound stage rather than at the Fox Ranch. The cramped party doesn’t look like much fun. Fortunately, “Morale Victory” also features a wonderful Charles storyline. Does it strain credulity that out of all the surgeons in Korea, Charles is the one who operates on a concert pianist? I suppose but I can let it slide. 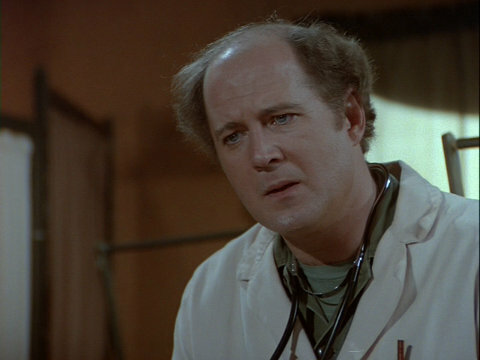 I’ve said it before and I’ll say it again: the longer I’m a M*A*S*H fan, the more I come to appreciate David Ogden Stiers. The speech resonates with anyone–myself included–who has always dreamed of being able to play an instrument, to truly play it. I took piano lessons when I was a kid. I can “play” the piano. I can “play” recognizable songs. But like Charles, I cannot make the music. Charles learns that Private Sheridan is a concert pianist. You can learn more about Paul Wittgenstein at Wikipedia as well as a lengthy article in Limelight magazine from 2014. Here‘s a YouTube video with audio of Wittgenstein playing Ravel’s “The Piano Concerto for the Left Hand in D major,” the piece Private Sheridan plays. With the exception of the first notes, we never see Sheridan actually playing the piano. Careful camerawork, including closeups of a robed arm tickling the ivories, makes it look like actor James Stephens is playing. I wonder who that arm belongs to. The 100-10 Field Service Regulatiosn manual is real. You can find the November 1943 version at the Internet Archive. Excellent summary of this episode. 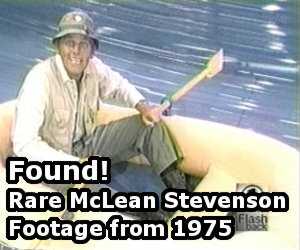 It was re-aired in METV in the last week or so and I was reminded again of how terrific Charles’ was in this episode. Stiers performance definitely saved this one from being a ‘bottom 10’ in the list of M*A*S*H episodes. Well, I was fortunate enough to have the talent to play the violin and piano and to make music with both. Who knows where I’d be if I didn’t get burned out in college with having to practice and perform so much. I absolutely love the Charles/Private Sheridan part of the episode. Charles’ reaction to the news that Private Sheridan is a concert pianist still makes me a bit teary-eyed. A big part of me would be gone if I lost the ability to play. I agree – excellent summary of this episode. The Hawkeye/BJ part is simply absurd. Even my kids noticed this when they were younger (pre-teen). Order from Adam’s Ribs and have a good time. I liked this episode, mostly for Winchester’s subplot. I may be one of the few whose favorite character is Winchester, but this episode gives a lot to those who like him. That was an excellent scene quoted above, and I can hear the words in my mind as they were said as I read them above. The main plot was a lot of silly fun. I can still head Igor’s speech in my head. Aside from this episode, it looks as though he usually is the cook, at least until Val Bisoglio’s character takes over the kitchen in the last couple seasons. Unfortunately if you take these episodes as a chronology according to original air date, the “Morale Victory” was very short-lived, as the very next episode aired, “Lend a Hand”, involved another morale crisis handled by trying to celebrate a non-existent birthday. There’s so much to say about this episode, it would take all day to write it. The movie at the beginning is “History Is Made at Night”. Hawkeye: The immortal words of Elizabeth Barrett Winchester, “How do I love me? Let me count the ways”. BJ: Once more, from the Arrogance Ballroom, you’ve just heard Satchmo Winchester blowing his own horn. Sorry to nit-pick, but I truly believe during Charles’s eloquent monologue to Pvt. Sheridan, he should’ve used contractions several times. Hawkeye: It’s just that kind of unashamed con-artistry that has made you an indispensable cog in the new Pierce-Hunnicutt happiness machine. The lack of contractions is used by writers and speakers for emphasis. Simply saying, “loss of your hands can’t take away your gift” doesn’t have the same impact as CANNOT take away your gift. It’s more dramatic to do away with contractions when trying to make an important point. Not to mention it’s just the way Charles, a prim and proper kind of guy speaks. He would see all those can’ts and don’ts as lower class and guttural. The only part of this episode I even remember are the scenes with Charles. I think of this episode a lot because it’s one of the best performances he ever gave, my personal favorite followed by the episode where he gave candy the the orphan kids that was exchanged for real food for Christmas. Charles has long been my favorite Mash character, and he may be my personal favorite of any character ever on television. Who Does ACTUALLY play the piano for THIS episode ? Who did the robed arm really belong to ? Why wasn’t credit guven? This might have worked better as a stand-alone episode for Charles, because he really does show his humanity and compassion in this one. Folks keep commenting that they should have ordered Adam’s Ribs and had a barbecue. Did everyone forget that Adam’s Ribs is in Chicago, and that the shipment probably took several weeks to get to Korea? Meanwhile, Klinger was driving to Seoul for Potter, Winchester, and Houlihan, and Incheon is only another 30 minutes away. He could have gotten everything in one day. Is it plausible that the Ravel sheet music was easily found on Klinger’s errand to Seoul? It seems obscure enough that it would have required a special order. A few things about this episode must be addressed. First, I believe James Stephens looks a lot like David Hyde Pierce from “Frasier”. And, if Potter expected a big goose egg from Hawkeye and BJ as morale officers, why was he miffed when they couldn’t even do that poorly in the first place?